I'm looking for a new microphone solution. I've burned through 3 Microvoxes in the last few years ; they work for a while, then the wiring gets wonky and unreliable, usually failing in the middle of a gig. A gooseneck solution probably isn't practical for me; mostly, I play in dance bands and I switch concertinas (CG to Gd to baritone) frequently, sometimes in the middle of a set. Two regular mics , one on each side, makes some sense, but I get the pulsing effect from the varying distance to the mic as the bellows move in and out. So what I'm left with: a single mic in the middle. As we've discussed many times, this is a less than optimum solution. What I'm wondering: is there a particular model of microphone that might do better in this configuration than the very mundane Shure sm57 and similar units? Something with a pickup pattern that would be suitable for an instrument that pushes sound out the sides? Obviously I don't want something omnidirectional - don't want to pick up all the ambient stage noise. But also don't want something highly directional. Has anybody found a microphone that works reasonably well this way? Yes, I know two goosenecks and a belt mixer will produce better sound, but for what I do, I just don't that's practical. I should add that for most dances, I'm at the mercy of the sponsoring group's (often antiquated) equipment and their sound people. Generally, they use very standard, low end mics. Bringing my own mic is one of few things I can control. Hoping for some help here! I also play in a dance band and face exactly the same problem. Our EC player uses a pair of AKG goosnecks with holders velcroed to the concertina, but I'm not keen on sticking velcro onto my instruments so I've tried various ways of attaching mics, including elastic straps around the frames and velcro cable ties around the hand straps. I'm currently using a pair of Thomann T-bone CC75 goose necks. The clips attach to the hand straps and are quickly transferrable. * your DIY goosenecks could attach any number of ways ; Jody uses velcro but you might come up with your own method! * Matt Quinn, Maccann player, says t.bone is "brilliant. Warm sound, nice short neck, big heavy duty clip, plus it's really cheap"
* way cheaper in the UK than in the USA! * Matt Quinn "Always hated them. Alway gave me feedback and too big"
I've used two AKGs (with an old belt-pack by some third-party company), borrowed from somebody, and I concur that they're just too big and bulky. The melodeon player next to me in the band was having feedback issues with his AKG c516s, for what that's worth. * way cheaper in the USA than in the UK! * keeps everything out of the way of your hands, puts the microphone where it needs to be, and doesn't harm your instrument! Having done this research, my current leaning is towards a pair of AT Pro35 microphones ... initially, I'd given some priority to the beltpack and having only one board channel, but I've had many players and sound engineers tell me this isn't really an advantage, especially when one takes the low quality of Microvox gear into account. They're pricey, but seem worth it. But if others here have experiences to share, I'd love to read them. Jim, when you switch concertinas mid-set, do your arrangements tend to give you sixteen or thirty-two bars in which to make the switch, or not even that much time? I currently use the AKG C 516. I have 2 sets, and 2 of the small B29L transformer preamps. I also have micro XLR to XLR adaptors to send a separate left and right channel to the board if a "real" sound system used. Most of my performances use C/G anglo and flute. However, if a small festival stage time ( 1 hr ), and I use both C/G and Bb/ F, I use 1 set of mics and one preamp to the board. The AKGs slip out of the mounts quickly to change to the other concertina. The spare mounts can be purchased from an AKG dealer. Two mics on boom stands approach might sound better, but the feedback issue, and the sitting in a very locked in position keep me from doing it live. The other thing is I always have a vocal mic in front of me to play flute/ whistle. The 3 stands start looking odd, and crowded. If 2 mics, a pair AKG C 1000s work well for concertina. A small head shell changes the shape of the pick up pattern, and allows to get great results with a concertina or melodeon. Someone asked if I thought good microphones were too expensive, and wanted a budget idea. I told them, I have 10k worth of instruments to perform with, should I spend at least enough to make them sound their best? My mic kit for concertina is about 700 dollars. Well worth it to know what I will sound like to an audience. Lawrence, do you know why the B29L was discontinued, and whether there's any compatible product (or likely to be a new version of it at some point)? I'm wondering if it's practical to devise a system for attaching something like this mic to plastic bracelets on the wrists, perhaps with velcro. Switching instruments with the Microvox is far from perfect - if I forget to turn down the gain first, I can watch my bandmates wince when I rip off the velcoed pickup and attach it to a different instrument. Moving the pickups always seems to produce pops and tearing sounds, amplified by hundreds of watts of PA power. I imagine a similar, although perhaps less severe, problem with mics that attach with clips. I still wonder if it's possible to find a single mic that can be placed on a stand over the bellows midpoint and produce a strong enough signal. What I have found in some experimentation: a single, very basic mic (SM57) at midpoint produces much less gain, but better quality sound, than the Microvox (when it works). But the signal is weak, sometimes so weak that I disappear from the floor mix. So naturally, I'm wondering if a more specialized, higher quality mic might produce sufficient gain to make this a good solution for me. Or something like the Audio Technica affixed somehow to my wrists. To expand on my earlier reply, I used to use AKG C416s for both concertina and melodeon - great mics but with fragile mount which kept breaking. For the concertina I ditched the mounts and used velcro cable ties (two per mic) wrapped around the hand straps. This works well, but swapping instruments is quite slow. I've had no feedback problems with the Tbones. I have had some breakages, which I think was due to twisting them too much to get them at the right angle. I'm now more careful and (touch wood) I've had no further problems. They're cheap, and you get what you pay for, but they're good enough and in a ceilidh band context they do the job. If I were playing solo I'd perhaps be looking for something better. Ok I haven't tried this, but maybe one of those PZM "boundary mics" could be placed on the stage bellow your seat or in front of your feet if you don't stomp around a lot? They have a hemi-spherical pick up pattern but I currently do not have access to one or I would try it out. I think Radio Shack makes the low cost version of the Crown pzm. I was also thinking of trying one of those country man lavaliere mics they hide up in the cowgirls wigs, one for each side. Here's a photo of the gooseneck mounting system I devised and have used for two ceilidh dances this month. The system seems to work, but I'm not satisfied with the AKG-519s I'd borrowed for these gigs. After interviewing a dozen people, I'm taking Rob Harbron's suggestion and ordering a pair of Supralux PRA-383D XLR mics which I'll have by the next ceilidh I'm playing, in three weeks. I'll review them then, and I suspect my mounting system will get a little smaller and more refined with the new, smaller, mic clips. These mics don´t have a bass range so I have much less problems with bass-feedback, also with low "rumble" noise. Concertinas don´t have much bass anyway. A problem here is that some of the reeds are further away from the mic, so some notes are louder than others. I baffle all my concertinas because I want to dampen the harsh high sounds. I pierced holes in the baffles in the higher ranges (where the higher reeds are) to soften that problem a little. I guess, microphones on a concertina are always a compromise. 2 good mics on stands are probably the best for recording. The distance decides wether it pics up more of the action noises or the room. Also you can get the "doppler effect" (I miss that beautiful sound) that is the sound when you move the concertina in the air. Alistair Anderson does it a lot. No doppler effect with mounted mics. On a loud stage you can not use microphones that are so far away because they pic up everything around you. If you turn them louder you get feedback. Sorry in advance if this question displays my profound ignorance! I have M500s and the Microvox PSU, but am considering this set-up so I can use phantom power. However, Microvox says that the M500s need a power source, and have to be isolated from phantom power to protect the mics. Is anyone using this set-up who can reassure a nervous technophobe that it will work and not damage anything? "My box feeds the correct polarising voltage to the Microvox electret microphone - this is derived from the Phantom supply and there is no danger of damage to the microphone." On tour in England last week, I had a nice conversation with Harry Scurfield. He showed me his baritone Dipper with 8 electret mikes installed inside it. These mics are the same type as what the Microvox system uses and by themselves cost pennies. The way he had it set up required no holes drilled or velcro to be glued on and was pretty much invisible. The mics and their wires were hidden behind the end plates, 4 to a side and wired in parallel. A female 1/4" phone plug was nestled under each hand rest. Yes that does sound neat. 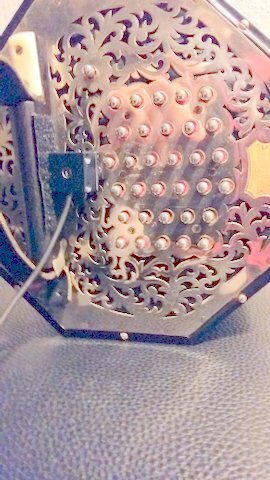 I love the internal mics in my melodeon but didn't think it was practicable on a concertina. I have Myers concertina mics, which were a great replacement for the Microvox a few years ago. But, like microvox, they have these flimsy wires which always feel so vulnerable to accidental pulls. Does no one else use Myers? The saddle clips sit nicely on the thumbstraps of an EC and make swopping instruments quick and easy. I made a pair of goosenecks from heavy, bendable insulted wire with an alligator clip on one end, and a velcro pad glued to the other. Mics are held on with velcro and cable ties. I fastened 3/8 inch nylon cable clamps to the concertinas as anchoring points. All attached in a non-marring, reversible manner. So far I am very happy with the equipment and sound quality and attachment method.